First thought: That is pretty expensive for a single non-unique squadron. But let's look at the stat line: Speed 3, Hull 8, Anti-Squadron of 3 Black, and Anti-Ship of 3 Blue (no Bomber). That is pretty respectable all by itself. Add Rogue and Counter 1 and it just goes from good to great! You have a squadron that can do everything pretty well, and is hard to kill and get points from. Add on Heavy and it is almost a blessing, in that it disincentivises attacking the VT-49. Oh, remember how I was talking about parking Valen behind some YV-666s earlier? I changed my mind. So overall a good way to invest in the squadron game, blow up some generics, and not lose your fairly expensive squadrons. Problems - it doesn't do much for Scatter elites, unless you can get some other shots on the target, and it is expensive to begin with. And Scatter elites tend to be less expensive than it is. On the plus side it does damage per point cost comparable to an A-Wing. Loses Heavy. Adds a Brace. These are both good things. The best thing is that her special ability lets her spend her Brace to reroll any number of dice - and that just turns the expected damage of the ship from good to great! Oh, and you can never get rid of that Brace token, because when she activates, she regains it. For 5 points this upgrade just makes sense. If you have that 5 points you should always be running Morna before the generic version - it does what the generic does, but just does it better. It still has the same problems though - it isn't going to do much to a Scatter elite. But that isn't why you are taking it. Hmm, I've been rather unimpressed with the generic version. Heavy and no Grit means that your opponent can just feed chaff to tie down the decimators while the rest of their squadrons go off an do something important. Maybe take one as a cleanup hitter, but Bossk is only a point more. You might consider a generic Decimator, Morna Kee, and Valen as a generic killer team. Valen and Morna can hold things down while the Decimator tanks the hits for Valen. And only one of them needs activations (Valen), but in a pinch you can use him just for the pin during the engagement turn. 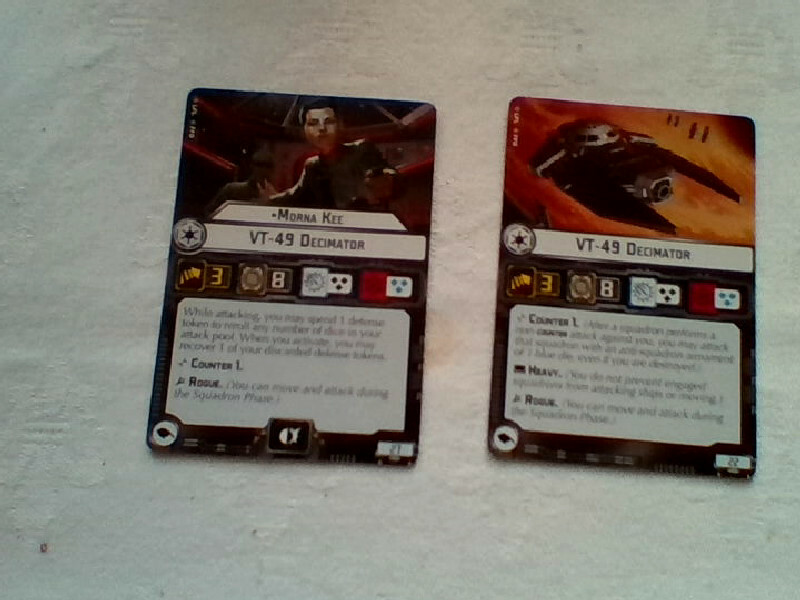 I've found Valen and Ciena to be good stablemates for a decimator. BTW, why is the URL demolisher.html? Congratulations! You've found an easter egg of why I should have a proofreader! Matthew how are you finding Decimator in current meta?